In addition to the reasons listed above, there are other reasons a tooth extraction may be required. Sometimes dentists pull teeth to prepare the mouth for orthodontia. The goal for orthodontia is to properly align the teeth, which may not be possible if your teeth are too big for your mouth. Likewise, if a tooth cannot break through the gum (erupt) because there is no room in the mouth for it, your dentist may recommend pulling it. This is especially true, again, with wisdom teeth. If tooth decay or damage extends to the pulp – the center of the containing nerves and blood vessels – bacteria in the mouth can enter the pulp, leading to infection. Often this can be corrected with root canal therapy (RCT), but if the infection is so severe that antibiotics or RCT do not cure it, extraction may be needed to prevent the spread of infection. If periodontal disease (an infection of the tissues and bones that surround and support the teeth) have caused loosening of the teeth, it may be necessary to pull the tooth or teeth. 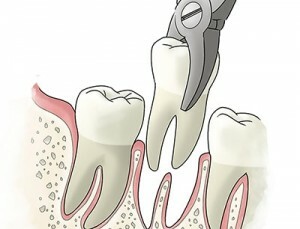 Dentists and Oral surgeons (dentist with special training to perform surgery) perform tooth extractions. Before pulling the tooth, your dentist will give you an injection of a local anesthetic to numb the area where the tooth will be removed. If the tooth is impacted, the the dentist will cut away gum and bone tissue that cover the tooth and then, using forceps, grasp the tooth and gently rock it back and forth to loosen it from the jaw bone and ligaments that hold it in place. Sometimes, a hard-to-pull tooth must be removed in pieces. You’ve heard the saying, “It’s like pulling teeth“….sometimes they can be difficult, particularly for a wisdom tooth extraction. Once the tooth has been pulled, a blood clot usually forms in the socket. The dentist will pack a gauze pad into the socket and have you bite down on it to help stop the bleeding. Sometimes the dentist will place a few stitches-usually self-dissolving-to close the gum edges over the extraction site. Following your extraction, it’s back home to recover. Recovery typically takes a few days. The following can help minimize discomfort, reduce the risk of infection and speed recovery. Apply an ice bag to the affected area immediately after the procedure to keep swelling down. Apply ice for 10 minutes at a time. After 24 hours, rinse your mouth with a solution made of 1/2 teaspoon salt and 8 ounces of warm water. Continue to brush and floss your teeth, and brush your tongue, but be sure to avoid the extraction site. Doing so will prevent infection. Once your mouth is healed, and the infection gone, depending on the location of the extraction, you may wish to have the tooth replaced with a dental implant or a bridge. Dr. Tony is always pleasant and in a great mood. He always makes me comfortable and at ease. Not an easy task for a dentist!! He’s just a joy to be around! Any work that done has been pain free and done right. You can just tell he’s great at what he does! The staff and hygienists are also very nice and helpful. Perhaps the best thing of all is you NEVER EVER wait a long time to be seen. They get you in and out in no time. Just the best!! !